We are a licensed contractor specializing in all types of concrete works. We have been serving residential and commercial clients in Queens, NY and nearby cities for years, making us a reputable company that property owners can rely on. Clients also choose us over other contractors in the area because of our great work ethic, level of expertise, and dedication that we pour into every project. If you want the best results regardless of the complexity and scope of the project, trust only in New York’s concrete experts – Vinny & Son Contracting. We have extensive experience in concrete works that include small-time projects and ambitious ones. Our team of skilled builders has worked on residential projects across Queens, and our company has likewise been tapped to handle concreting projects for commercial properties across New York. With several decades of experience combined, our people possess the required knowledge and skills in completing concreting projects both indoors and outdoors. Decorative concrete. Concrete can be the perfect material to use to decorate outdoor spaces without the usual hefty price tag involved. Among the decorative techniques that we can employ are stamping and staining. With stamping, we are essentially imprinting our clients’ desired designs onto the cement surface. Meanwhile, staining is basically achieving a specific look, usually that of a more expensive material such as natural stone. Outdoor living spaces. We can make your outdoors more functional and inviting by creating your desired amenities, such as patios, outdoor kitchens, decks, or sitting walls. Hardscape features. 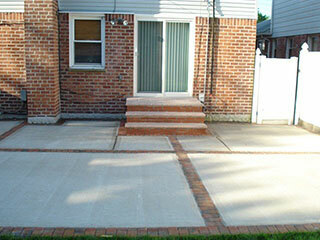 We can create the perfect walkways, driveways, and steps to suit your desired results. Our skilled crews will build each amenity from scratch, following your specifications for truly personalized appeal. 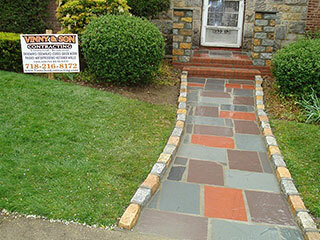 Aside from these, we can also handle all kinds of masonry works that clients may require. We have experienced workers who can work on flooring, baths, interior walls, outdoor fencing, and much more. Whether you’re aiming to improve your home interiors or you’re planning to develop your outdoor spaces, our crews can provide the necessary masonry solutions and services that you will need. At Vinny & Sons Contracting, we always give our 100 percent in all the concrete works that we handle. Whether the project requires the creation of perimeter fence for a private residence in Queens or it involves improving the functionality and beauty of a commercial area, our clients can expect only the best in terms of craftsmanship, aesthetic appeal, functionality, and durability of the amenities that we will create for them. With more than three decades of experience in European-inspired concrete amenities and several decades’ worth of experience in creating contemporary American indoor and outdoor structures, we are easily your best pick. No matter how simple or ambitious your design and build concepts may be, we have the right crews who will ensure that the project is carried out and completed according to your specifications. Call 718-539-0524 today for your inquiries about our rates and various services. We look forward to hearing from you.